40GNAI . 52WC . Animal print . Challenge . Nail Art . Purple . Stamping . Violet . You've probably read about my eternal confusion between turquoise, aqua and teal shades, and how I'm convinced this confusion is due to cultural background differences and how we divide and catalog colors in different languages, yadda yadda yadda. Well, here I am again bringing you yet another existential color confusion question. 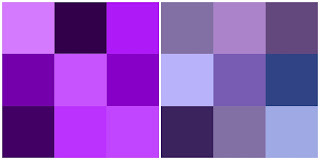 What is the difference between violet and purple?? In Spanish there are several ways to call the color purple (because there are so many Spanish-speaking countries with so many different ways to call things!). But to my knowledge the litteral translation of "purple" which would be "púrpura" refers to some sort of deep red formerly worn by nobility and royalty. In my home country all shades between blue and red would be call "Violeta", but in English that is sometimes translated as "violet" and some other times it is translated as "purple". Hence my confusion!! Now that we've settle that discussion I can show you my manicure. Today I was supposed to combine the prompts: Violet + leopard. I love Animal print and I love doing it freehand on my nails. But today, I had no time for freehand anything and I went with a stamping design. What do you think of this manicure? Yay or nay? Do you have the same hard time as me "defining" colors? If yes, which color is most hard for you? For many others violet manicures check the link-up here below.